The catch-all word for plants that do not lose their foliage in winter months is evergreen. This word is most often associated with trees but does apply to an assortment of other landscaping plants. From climbing vines to rock garden ground covers, shrub topiaries to hedged bushes, and ornamental to shade trees, a gardener could successfully create a landscape that would stay green year-round. The ground cover Vinca minor (periwinkle) has emerald leaves and dark fuchsia to purple-blue flowers; originally from Europe it has adapted to a variety of climates from semi-arid to humid. Hedera helix (English Ivy) is an Asian cultivar that climbs almost anything from walls to trees and has glossy dark green foliage. Asarum (Wild Ginger), native to the Pacific Northwest, prefers damp shade and sports large heart-shaped leaves; it is a creeper. A sun-lover, Artemisia (Wormwood), is also a plant native to North America and has dusty blue-green foliage 365 days a year. For rock gardens and stony soil, Sedum (Sedum, assorted varieties) is a ground cover and Russian native that tolerates cold very well. Hypericum calycinum (St.Johns wort) hails from Southeast Asia and covers the ground with long leaves and bright yellow flowers. For a deep ground cover with pinkish-purple flowers, Asian and European Lamium (Lamium) are a good options. Other flowering evergreens in this category include Fragaria chiloensis (Beach strawberry), Dryas octopetala (Mountain avens), Eriogonum (Wild buckwheat) and Lavandula (Lavender). Evergreen ground covers used just for their foliage color and shape are Pachysandra terminalis (Japanese pachysandra) and Euonymus fortune (Winter creeper) which has some fall color but never loses all its leaves. This category of landscape evergreen plants includes two segments, those with berries and those without. Many of the berry-bearing plants have prickly leaves and typically bloom white or yellow; these include Ilex (Blue Girl holly and Blue Boy holly), Berberis julianae (Wintergreen barberry), Berberis verruculosa (Warty barberry), and the Mahonias (Oregon Grape, Cascades, and Creeping). For less prickly berry-laden landscaping, try Nandina domestica (Heavenly bamboo), Arctostaphylos uva-ursi (Kinnikinnick), Pittosporum tobira (Japanese pittosporum), Cotoneaster dammeri (Bearberry cotoneaster), Prunus laurocerasus (Cherrylaurel), Pyracantha coccinea (Firethorn), and Skimmia japonica (Japanese skimmia). Evergreen shrubs that do not bear fruit are varieties of Buxus (Boxwoods), Cytisus (Brooms), Arctostophylos (Manzanitas), Pyracantha, and Rhodendrons, which flower in almost every color on the botanical spectrum. 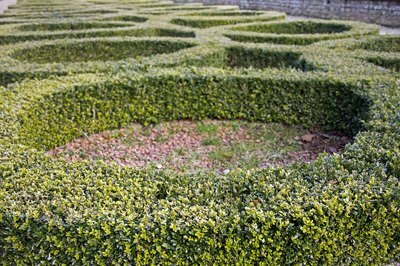 A gardener looking for evergreen shrubs and bushes should research his growing zone’s characteristics and follow with a search; it is quite probable there are unlisted plants that would do well. Landscape evergreen trees come in many shapes and sizes; some are low to medium height and spread out over a large area, others are round or globe-shaped. Many have the classic Christmas-tree pyramid silhouette; still others are cone-shaped, tall and narrow with a point at the top. Not all evergreen trees grow well in all climates or soils so research should be done before purchase. Arbor Vitae (Arborvitae) have large, soft frond-like foliage and will grow in a globe or cone; they do well in full sun to full shade and are not attractive if pruned. 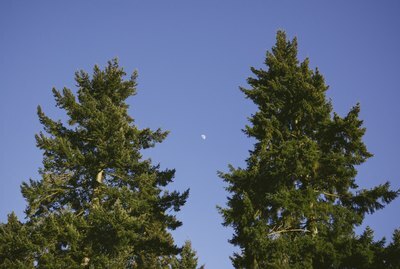 Abies (fir trees), and the trees called fir in the retail market, Pseudotsuga (Douglas firs), are pyramid- shaped and sun-loving. Juniperus (Junipers) spread, cone and globe depending on the variety and are healthiest in full sunlight. Pinus (Pine trees) are almost always inclined to pyramid—although they can be trained to dwarf and bonsai—and do best in full sun. Picea (Spruce trees) are also full-sun pyramid trees. Taxus (Yews) are large spreading evergreens that transition well between partial shade and full sun depending on variety.